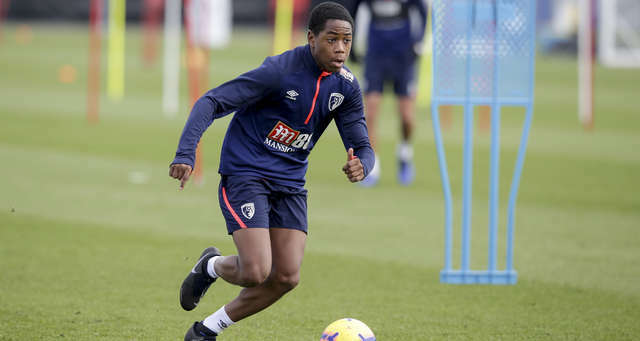 AFC Bournemouth Under-18s’ winless start to their Merit League One season continued with a 4-0 defeat at Stevenage on Saturday. Liam Smyth’s double and goals from Jack Smith and Devante Simms saw the Cherries remain at the foot of the table following two draws and four defeats. It was a much-changed Cherries side from Thursday’s 6-1 defeat at Arsenal, with Icelandic goalkeeper Rafal Danielsson, who joined the club on loan in February, making his debut for the under-18s. The Cherries goalkeeper was called into action early on, closing the angle and making himself look big to deny Simms scoring a gilt-edged opportunity. But there was little he could do about Stevenage’s opener. Bunja Conteh, who looked lively throughout, scooped a pass over the top of the Cherries back-line to Smyth. Played onside and in plenty of space, he made no mistake, burying the ball into the top corner for 1-0. Stevenage were looking relentless and could have had two goals within the next four minutes. Conteh was brought down inside the area by Danielsson in the 23rd minute, but blasted the spot-kick over the bar before Smith mastered his dead-ball situation in the 25th minute. Awarded a free-kick from distance, Smith connected sweetly and scored a fantastic goal into the top corner for 2-0. With just half-an-hour played, the home side made it three, giving the Cherries a huge mountain to climb. A throw-in close to the halfway line was launched down the right wing to Smith, who cut inside and played it to Simms, who found the bottom right-hand corner precisely. Danielsson made another top save shortly before half-time, stretching acrobatically to his right to push a venomous strike from Simms wide of the post before the Cherries almost got a goal of their own. A Tom Hanfrey cross was floated toward the far post where Jake Cope was waiting. Cope judged the flight of the ball well and connected with it sweetly, only to see his effort cleared off the line. The exhausting high press that had been a key part of Stevenage’s play in the first half died down in the second, allowing the Cherries to get a bit more control in the game, something which was also helped by Nathan Moriah-Welsh coming on at half-time. The Cherries had a couple of half chances between the 60th and 70th minutes, Cope sending a speculative shot from distance over the bar and Luke Nippard going closer with an inventive trivela volley that met the same outcome. The Cherries showed glimpses of what they are capable of in the second half, Connor Kurran-Browne, Luke Pardoe and Euan Pollock linking up with slick one-touch passing on a bobbly pitch, but the latter’s shot was too soft to trouble Jack Berma. With few clear chances created or taken by the Cherries, the game was put to bed with ten minutes to go as Smyth, cutting inside from the left wing, unleashed a powerful strike into the bottom right-hand corner from distance. The Cherries went close to scoring a consolation goal in stoppage-time when a Moriah-Welsh free-kick was played short to Pardoe. The forward gathered the ball in his stride, turned onto his left foot and saw his shot crash onto the post. “We started the game okay, but then we stopped doing things that were causing them problems. As we’ve done a lot lately, we gave away some really bad goals. It’s been tough because we haven’t had a settled defensive unit for a number of reasons. “We can’t keep giving away the goals we’re giving away. Yes, we’re going young with our team at the moment to try and kick them on, but there comes a point where you can’t keep losing football matches, at any level. “We won’t sacrifice the way we want to play and we didn’t on what was a terrible pitch, and yes we want to pass the ball, but we have to have more resilience about us and more tenacity. “While it maybe wasn’t a 3-0 scoreline at half-time, that was the reality. We only saw glimpses of the forward stuff we wanted to see. It was tough to go from playing on a pristine pitch at Arsenal on Thursday to a terrible one. “Some things you can’t let slide, so I made four substitutions at half-time and it could have been a lot more. We got a little bit better in the second half. Moriah-Welsh did what he does which is inject energy and passion into the game. He and Nippard were the ones who affected the game. “There were too many of us who were only interested in the ball and not what we were doing when we didn’t have the ball. It’s another defeat and we’re giving players opportunities, but there comes a point where the opportunities do become earned.